This whole house switch is a service equipment rated panel that integrates a main breaker, transfer switch, and load center. 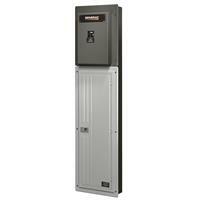 This hybrid panel allows for seamless integration of standby generators. Installation can be completed during any new construction or existing panel upgrades, and does not require the generator installation at the same time. Saving on installation time and space. -Designed for use with single phase generators that utilize the EvolutionTM or NexusTM controller. -Integrated load center accepts 1″ standard, GFCI, AFCI, or tandem circuit breakers from Siemens, Murray, Eaton and Square D.
-Utilizing tandem breakers, the load center can be expandable to 60 circuits. -Through the use of Digital Power Management technology, these switches have the capability to manage up to 4 individual HVAC (24 VAC contolled) loads with no additional hardware.